An ERP (enterprise resource planning) is a system of integrated enterprise applications that helps connect and streamline information and business processes across various functions within one organisation. ERP software used to be manufacturing-oriented, but it has evolved into full-fledged enterprise-wide software that encompasses all functional departments. ERP systems are now widely used in various industries, even in the public sector and in not-for-profit organisations. You can purchase ERP software as a comprehensive suite, i.e., a fully featured solution that encompasses all or most of your business’s functions. Typical examples include SAP ERP, Oracle E-Business Suite, and Infor LN. It is not uncommon for companies to purchase a few core modules of an ERP package, like finance and production. Companies choose this approach due to either business requirements or financial constraints. If you are in the latter group, you should pay extra attention to the ERP software’s ability to scale and upgrade. The large number of ERP vendors in the market can be categorised using the tiers system. These vendors offer top-of-the-line ERP solutions and often target large global enterprises. Their products are extensive in terms of functionality and cover many different industries. Tier 1 vendors understandably have the highest total cost of ownership (TCO). Recently, all four Tier 1 vendors have made drastic changes to move to the cloud and focus more on small and midsized businesses (SMBs). Tier 2 – Epicor, QAD, Sage, Deltek, SYSPRO, NetSuite, Acumatica, etc. These vendors often target midsized companies and offer products that are less complex and costly than those from Tier 1 vendors. 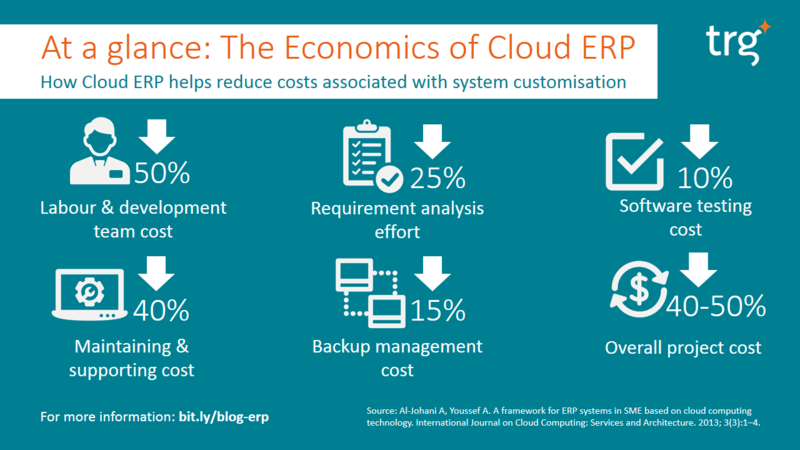 Many Tier 2 vendors are also investing heavily in cloud ERP. Tier 3 – abas, Expandable, Flexi, JDA, MANEX, xTuple, etc. Tier 3 vendors often target smaller companies in the niche verticals. Their products are usually reserved for single-site installation. In this section, we will elaborate on the strengths and weaknesses of some of the world’s best ERP systems. 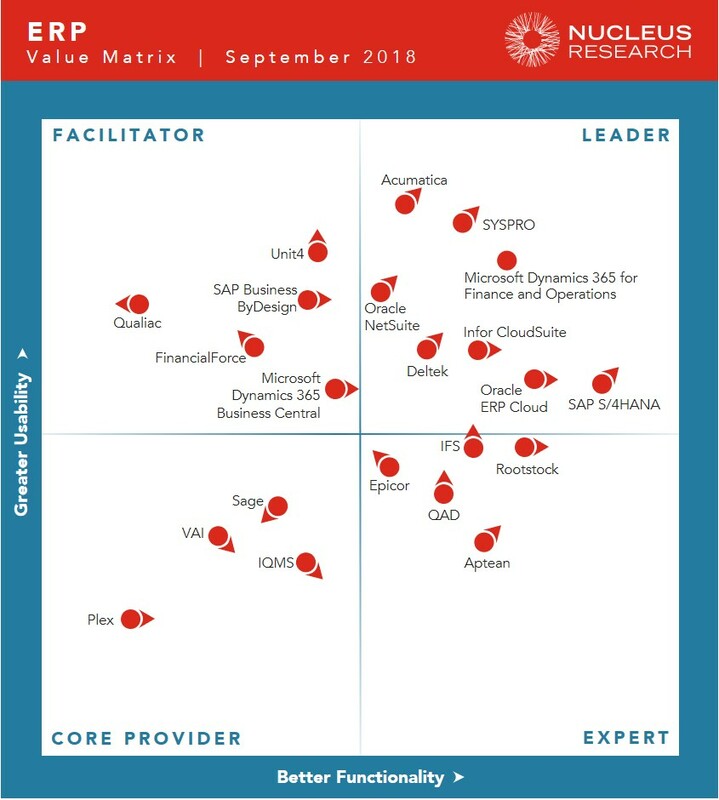 Nucleus Research, one of the market-leading technology research and analysis firms, periodically issues a special report—Technology Value Matrix—to evaluate and rate ERP vendors and products. As the name suggests, the Value Matrix assesses ERP systems in two capability dimensions. The vertical dimension is Usability, and the horizontal dimension is Functionality. Accordingly, ERP products are put in four quadrants: Core Provider, Expert, Facilitator, and Leader. The following figure shows the latest Value Matrix updated for 2018. It presents not only the positions of ERP products but also their directions in the matrix relative to other competitors. The products in the Leader quadrant, which are ranked high in both organic usability and functionality, include Acumatica, Infor CloudSuite, Oracle ERP Cloud, Deltek, Microsoft Dynamics 365, Oracle NetSuite, SAP S/4 HANA, and SYSPRO. They currently are the top market-leading ERP software. Infor CloudSuite Industrial (Infor SyteLine) is tailored for small and mid-sized businesses in discrete manufacturing across all industries. CloudSuite Industrial Machinery is more geared towards enterprise-size manufacturers who design, build, and service industrial machinery and equipment. CloudSuite Aerospace and Defense for manufacturers, and service providers in the aerospace and defense industry. CloudSuite Automotive for manufacturers, and OEMs (Original Equipment Manufacturers) in the automotive industry. CloudSuite Fashion for apparel, footwear, accessories, and textile manufacturers. All CloudSuite ERP solutions come with latest advancements in ERP technology like consumer-grade UX (user experience), in-memory analytics and mobility. The economies of cloud, prebuilt industry capabilities, and usability are three prominent benefits of adopting CloudSuite solutions. Hosted on Azure, Microsoft’s cloud infrastructure service, Dynamics 365 is the latest SaaS ERP offering from Microsoft. Dynamics 365 combines the cloud-based version of Dynamics AX, Dynamics CRM Online, Office 365, and several other services, like Cortana and Power BI. There are two main editions: Business Edition for SMBs and Enterprise Edition for large enterprises. Dynamics 365’s mainstay is Dynamics AX. It is Microsoft’s flagship ERP system, geared towards midmarket and lower-end global enterprises. Its customers come from manufacturing, services, retail, financial services, and public sectors. It was also positioned in the Leader quadrant in the last Value Matrix report thanks to continuous improvement during the last four years. A strong point of AX is the smooth integration with Microsoft’s vast ecosystem, such as Office, Dynamics CRM, Power BI, and SharePoint. AX is also an excellent offer for the retail industry. In comparison with SAP and Oracle, Dynamics AX is more customisable and less rigid, often requiring a shorter period of time to implement. It is a good choice for global enterprises that wish to deploy a two-tier ERP strategy, in which a SAP or an Oracle solution is deployed at the corporate level while Dynamics AX is implemented at the subsidiary level. Microsoft Dynamics AX is a rather comprehensive system, which covers essential business processes and functions, including HCM, CRM, finance, procurement and sourcing, production, and supply chain. This solution strongly supports multiple languages and currencies. Dynamics AX’s user interface is probably among the best in the market. The HTML5-based web client is mobile- and touch-friendly. Other familiar consumer-grade features are provided, including multiple tabs and side-by-side view. Screens and menus are rather intuitive and easily configurable to each user’s needs and preferences. On the downside, Dynamics AX lacks the functionality breadth and depth of similar Tier 1 solutions from SAP or Oracle. Its business intelligence capability is severely limited. Its reporting still heavily depends on Excel spreadsheets, and creating custom reports requires significant technical skills. A survey by MSDynamicsWorld.com, published in January 2016, found that only 2.7% of Dynamics AX customers meet their reporting and analytics needs. The financial reporting and budgeting functions are especially weak. HCM and CRM components are also rather weak. Compared with SAP, Oracle, or Infor, Microsoft has poor global support by system integrators for its solution. NetSuite has steadily become a prominent ERP provider thanks to its robust SaaS offerings. It features strong capabilities in the manufacturing, distribution, services, software, and non-profit sectors, and therefore it has maintained its position in the Leader quadrant. NetSuite’s continued focus on pure cloud solutions means its customers cannot choose other models of deployment. Consider NetSuite if your company needs its ERP solution to integrate with business processes like e-commerce, CRM, sales orders, and accounting. It is also a good choice if distribution is a large part of your business. However, if you want a dedicated solution for manufacturing management, it is not a good fit. Best suited for light manufacturing industries with assemble-to-order, make-to-order, or repetitive manufacturing models, NetSuite is not very good at supporting engineer-to-order. In December 2016, Oracle acquired NetSuite in a US$9.3 billion deal. SAP is the world’s biggest provider of enterprise applications. SAP ERP, which is geared towards large global corporations with complex requirements, continues to be ranked high in terms of functionality. The application breadth and depth of SAP ERP is impressive and covers most major sectors—discrete manufacturing, process manufacturing, consumer industries, service industries, financial services, and public services. SAP ERP’s greatest strengths lie in its ability to scale and handle the most complex business processes as well as its abundance of consultants worldwide. It now supports more than 25 industries, 37 languages, and 46 localisations. SAP ERP also excels at integrating advanced capabilities, such as business intelligence and analytics. With HANA, an in-memory, column-oriented database, SAP ERP is able to accelerate data processing and improve information delivery. Users are promised to be capable of performing in-context BI without the need for a separate BI application. SAP ERP is, however, very expensive and takes a long time to roll out. Its limited score for usability prevents it from being in the Leader quadrant, while its breadth and complexity make deployment a risky undertaking. SAP ERP’s high TCO (total cost of ownership) is well known, and so is its highly complex pricing and licensing schemes. The cost of acquisition may include a pre-determined core ERP price plus extension packages. Each package can be priced differently based on various business metrics—revenue, the number of employees, the number of processors or memory used by the software. In addition, each user has to have a named user licence, a model that is vague. For example, a “professional user” is defined as someone who performs operation duty on the SAP system, whereas a “limited professional user” is someone with limited operational actions. Of course, the term “limited” is open to different interpretations. Another area that is particularly vague is its indirect access policy. Indirect access happens when another solution accesses data in the SAP system. One example is when business intelligence software draws data out of the customer’s SAP database. So SAP’s customers may find themselves unaware of the fact that using their own data is not free. A 2012 survey by the UK & Ireland SAP User Group indicated that 95% of SAP customers found the company’s licencing scheme “over complicated”. Epicor ERP continues to excel in the segment of small and midmarket businesses—those with fewer than 1,000 employees—in manufacturing, distribution, and retail sectors. Like many other vendors, Epicor is moving aggressively to the cloud. Epicor’s customers are now able to choose their favourite deployment method (on-premises, privately hosted, or cloud). Epicor focuses on delivering faster time-to-value and lower total cost to maintain and offers industry-specific products. The latest release—Epicor ERP 10—is a significant improvement over the previous version and has delivered increased performance. It does not, however, include a major leap in functionality. The ability to support customers’ implementation and upgrade outside the North American market are also weak points for Epicor. 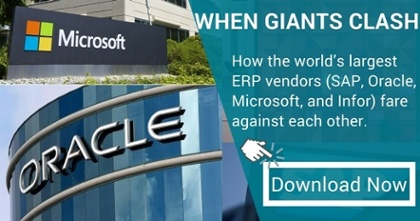 Oracle is one of the largest ERP vendors on the market. Oracle E-Business Suite is positioned in the Leader quadrant partly due to its deep and extensive functionality as well as a wide range of applications. Oracle E-Business Suite is well suited for large global enterprises operating in product-centric industries, such as automotive, aerospace and defence, construction, mining, consumer goods, communication, and high-tech products. Oracle is also moving to the cloud, hoping all of its customers will make the transition from on-premises to cloud-based systems. Oracle E-Business Suite offers a wide range of functional models that are seamlessly integrated. It is highly scalable and strongly supports companies with complex, multisite operations. Customers also benefit from a large ecosystem of enterprise solutions, including Siebel (CRM), Fusion (middleware), and Hyperion (performance management), as well as a network of Oracle partners around the world. This well-refined product has been around for quite some time and now is a solid system with very few bugs. Midsized enterprises, however, may find Oracle E-Business Suite’s complexity too costly to implement and maintain. Additionally, Oracle’s push for Cloud Applications, its SaaS offering, means customers that choose on-premises deployment may not have the new major capabilities. Once you have decided to embark on an ERP project, the difference between success and failure begins with selecting the right package for your business from a host of ERP vendors, products, configurations, and feature sets. At the end of the day, it is all about your requirements, and whether the chosen solution is the right fit for your organisation. Unfortunately, there is no one-size-fits-all answer, nor is there a simple approach. You need in-depth knowledge about ERP software and the marketplace, accompanied by a systematic and meticulous selection process.